Reprint. Originally published: 1994. Illustrated by Terry Gilliam, Gary Marsh and John Hurst; music edited by John Du Prez. 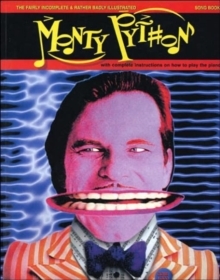 From 'The Lumberjack Song' to 'Always Look on the Bright Side of Life', the Fairly Incomplete & Rather Badly Illustrated Monty Python Songbook does pretty much what it says on the cover, collecting up the cream of the Python team's musical output, from the four TV series and the various feature films.